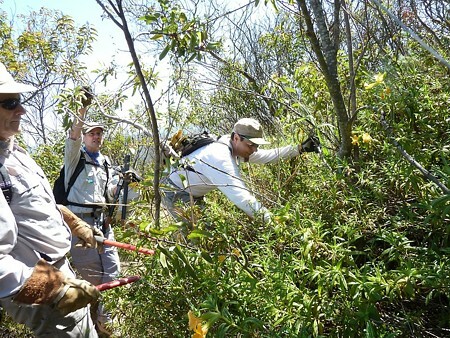 Clearing brush from the side of Guadalasca Trail in Pt Mugu State Park during Santa Monica Mountains Trail Days on April 28-29. Tales from the Trail: I regularly make a plea to mountain bikers to slow down, as it is the one true way to solve the only valid complaint hikers and equestrians have about mountain bikers on the trails: that bicyclists scare people because they go too fast. Well, I’d like to recount a very personal experience of just how true that complaint is. All I could do was apologize profusely and make sure the woman was okay. She was, but she could have very easily twisted her ankle, sprained a wrist, or worse. If the man carrying the baby had fallen, he would have had no way to protect the infant in the baby carrier. Both the man and woman were accepting of my apology, the man even saying “hey, it’s a trail.” But I couldn’t help thinking that perhaps the rest of their hike was now ruined. I know the rest of my ride was not all that pleasant. I didn’t think I was going that fast, and in fact I was able to stop in plenty of time and was never a threat to their safety. However, as illustrated above, I actually was a threat, because I startled them into a reaction that could have caused problems. 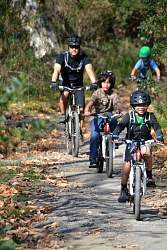 I often hear people trying to justify banning bicyclists from the trails by saying things like “what if a family with little kids were hiking and a bike came around a corner too fast, and they ran over the kids?” My response is usually something like “Of course we don’t want that to happen, but statistically it is not happening, so you can’t use a hypothetical situation to justify a restrictive policy.” And I still feel this way. But you can bet I’m going to go even slower around corners, especially on trails that I know are used more frequently by families. And I’m going to continue to promote the message of slowing down for corners, and always slowing to other users’ speed. Please take a moment to think about why you ride on trails. Hopefully it’s to enjoy and commune with nature. There’s nothing wrong with pushing your aerobic and bike handling levels, but remember that there are others out there for the same reasons you are. Treat others as you would want to be treated. Ride as if there’s always someone around the next corner. Possibly a family with kids. On May 15th at 7:00 pm, the Rancho Palos Verdes City Council will review and approve the final trails plan for the Palos Verdes Nature Preserve. This is mountain bikers’ last chance to ask for changes. We need your support. Attend the meeting even if you don’t want to speak. Write the Rancho Palos Verdes City Council, CC@rpv.com. Please make the letters positive. Help Us Celebrate CORBA's Silver Anniversary! 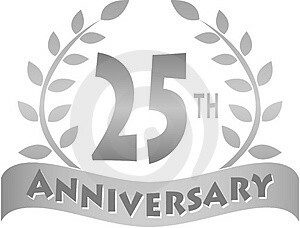 In 2012, CORBA will celebrate its 25th anniversary…quite an accomplishment. Current and past CORBA leaders are planning a celebration befitting of this milestone and would like to invite input from our members, supporters, land managers and others as to what that event should be. One idea is to produce a documentary chronicling the history of CORBA from the inception back in August of 1987 until present day telling the story of CORBA’s programs, education, advocacy and volunteerism. If there are any film makers or documentarians that would like to help with this project, please contact us as soon as possible. Anyone else who has ideas or would like to help in any way please contact CORBA at info@corbamtb.com. CORBA was very much involved in last week’s California Trails and Greenways Conference. 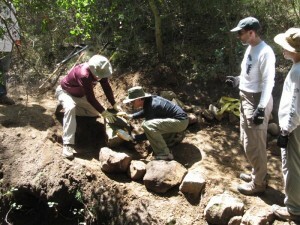 This annual event brings together land managers at the Federal, State, County and City levels, along with resource planners, volunteers, non-profit organizations and professional landscape architects and trail builders. The theme for this year’s conference was “Navigating Radical Change.” The most radical of all changes that land managers are facing is the shrinking of budgets for trail and open space projects. Another is the changing demographic of trail users. Many sessions at the conference talked about the importance of engaging volunteers, of reaching out to foster public-private partnerships between land managers and non profit advocacy groups. CORBA has already been putting into practice many of these principles, partnering with the Forest Service and State Parks to help maintain trails; partnering with the So Cal High School League to empower the next generation of off-road cyclists as advocates and stewards. CORBA President Mark Langton participated in a rousing panel presentation on the Conejo Open Space Conservation Agency, a multi-use trail system that has worked successfully with minimal conflict for more than two decades. On Saturday, after the conference, Orange County’s Trails4All brought 6 equestrians, 4 hikers, and about a dozen mountain bikers from CORBA, SHARE, SDMBA, CCCMB together for a ride/hike/run/hoof event. 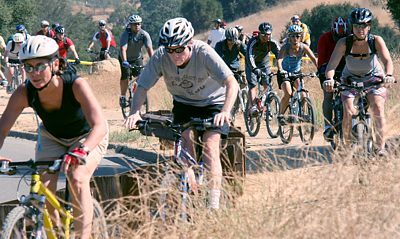 We travelled together on the trails of Malibu Creek State Park, showing again that where there is respect and cooperation it is very possible for all user groups to co-exist peacefully on the trails. These meetings underscore the importance of working together, and create at an atmosphere conducive to constructive and informative exchanges of information and viewpoints. This work day was cancelled because rain the previous day left us with wet and muddy conditions. Over the weekend of April 28-29, about 200 volunteers had a great time chatting, chowing on a fabulous barbecue meal, taking in the scenery, winning wonderful prizes, and if they liked, camping overnight in the Danielson Multiuse Area in Pt Mugu State Park. The reason for the revelry was the 31st annual Santa Monica Mountains Trail Days where outdoor enthusiasts of all varieties got together to repair trails for everyone to enjoy. On Saturday, 34 volunteers joined the CORBA crew and we cleared out overgrowning brush on Guadalasca. On Sunday, a much smaller crew went out to Sin Nombre to fix up some problems near the bottom of that trail. There were some great prizes at the giveaway after dinner on Saturday and after lunch on Sunday. Two North Ranch riders came away with $350 RST 29" front forks. Grand prizes were a down sleeping bag, two 2-person tents (from North Face) and a $100 gift certificate for Westlake Cyclery. Everyone won something, and there were lots of prizes to choose from. 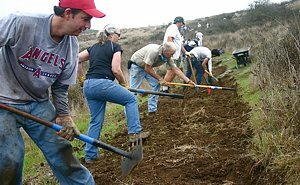 On Sunday April 15, as part of National Volunteer Week, about 40 Amgen volunteers gathered in Pt Mugu State Park to work on the Sin Nombre Trail. 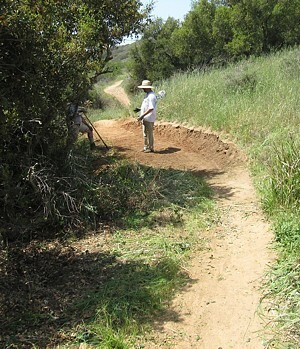 Most of them worked on fixing ruts and cutting back overgrowing brush, but 8 of us, all but one mountain bikers, split off to fix up the dangerous corner near the top of the trail at Ranch Center Road. We widened the trail and fortified the outside edge with large rocks. Gaps were filled with smaller rocks, then everything was covered with dirt. The problem is at a dip to cross a very small stream, combined with a tight left turn. After slowing to negotiate the turn at the stream crossing, the rider encounters a short but unexpectedly steep climb out of the stream. Because the trail has been downhill until this point, often people are in too high a gear and stall trying to climb the hill. When they put their foot down, they discover that the trail is also narrower than expected and there is little room for their foot, and they can fall about 6' down the steep bank to the rocks of the stream. Many riders have fallen at this turn; some were taken out by helicopter with serious injuries. The solution was to build up the outside edge of the trail with large rocks to make it a little wider. After a lot of digging and relocating really big rocks, the trail is almost a foot wider. The rocks also armour the outside edge of the trail so it’s less susceptible to errosion. As we were working, a large number of mountain bikers rode through; some told us of stories of having fallen at the corner and injuring themselves. One fellow fell in and hit his neck. He couldn’t move, being paralyzed in all his limbs and with no feeling in them. That lasted for what must have been for him the longest 10 minutes in his life, before feeling started to come back and he could move again. It turns out he’d sprained his neck. Talk about a close call! Another rider said he tore his shoulder and broke his collarbone when he fell there. We believe the trail is safer after our work, but it is still risky to people who are taken by surprise by the steepness of the climb. The trail is wider so it’s easier to put your foot down on the trail, but if you’re riding too close to the edge, you can still go down the bank. Always be careful on this corner, and advise less experienced riders to get off their bikes and walk! 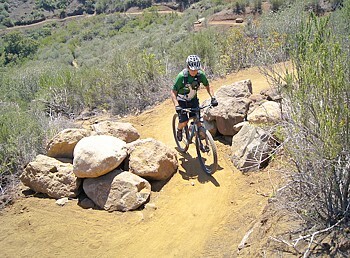 Next CORBA Kids Club ride will be Saturday May 5 at Malibu Creek State Park. See our Rides Calendar for details. Saturday May 5th is the next skills clinic.